The Saraswati River is believed to have drained the north and northwest region of India in ancient times, supporting over 1,6000 settlements.Although the river does not have a physical existence today, there are numerous references to it in the ancient Indian literature of the Vedic and post-Vedic period. Rig Veda, the most ancient of the four Vedas, describes Saraswati as a mighty river with many individually recognized tributaries. The sacred book calls Saraswati as the seventh river of the Sindhu-Saraswati river system, hence the name Saptsindhu for the region bounded by rivers Saraswati in the east and Sindhu (also Indus) in the west. Rig Veda hymns also describe life and times of the people residing in the Saraswati river valley. The awe and reverence the river inspired during the Vedic period is best summed by the three-word tribute to the river in the Rig Veda-Ambitamé, the best of the mothers; Naditamé, the best of the rivers; and Devitamé, the best of the goddesses. 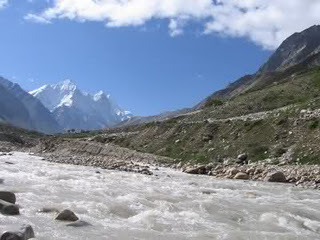 River Saraswati originated from the Har-ki-Dun glacier in West Garhwal, Bandarpunch massif in the Himalayas, along with the river Yamuna. The two rivers flowed parallel for some distance and later joined, proceeding south as the Vedic Saraswati. The seasonal rivers and rivulets, including Ghaggar, joined Saraswati as it followed the course of the present river through Punjab and Haryana. River Sutlej, the Vedic Shatadru, joined the river Saraswati as a tributary at Shatrana, approximately 25 km south of Patiala. Saraswati then followed the course of Ghaggar throughRajasthan and Hakra in Bhawalpur before emptying into the Rann of Kutch via Nara in Sindh province, running parallel to the Indus River. It has been established that the river Saraswati, carrying the waters of three perennial and numerous seasonal rivers, was a mighty river in the Vedic times and rightly deserved the Rig Veda title of Naditamé-the greatest of the rivers. During the Vedic period, Saraswati was recognized as the greatest of the River that nurtured the people living on its banks like a loving mother, and supported a number of learning centers and their resident scholars, ascetics, sages and seers like a benevolent deity. In view of this, it may be safe to assume that the ancient Vedic literature was itself written on the banks of this river. By nurturing such a pursuit of divine knowledge, Saraswati appropriately assumes the status of the goddess of language, learning, arts and sciences-the best of the goddesses. Post-Vedic literature, mainly the Mahabharata, has references to the drying river Saraswati. Mahabharata describes Balarama’s pilgrimage from Dwarka to Mathura along the bed of this river. Later, during the middle ages, there are references to fissures and faults in the ground on the dry bed of river Saraswati. Invading armies of Islam marching from Sindh province to Delhi are reported to have taken a longer mountain route instead of the shorter route of the dry Saraswati bed because of the difficulties in crossing the fissure in the river bed. Recently, satellite images have also confirmed the existence of a large number of ground faults in the earthquake-prone northwest India that constituted the Saraswati-Sindhu valley. Such ground faults have caused the seepage of Saraswati water to underground channels, contributing to the legend of the Vedic Saraswati disappearing underground. How and when was this mighty river lost? Researches have shown that the course of this river had links with the dry bed of Ghaggar River in the northeast (Ganganagar district) while in the southwest it met or cut across surviving courses of the Hakra and Nara rivers in Pakistan. In the northwestern part of Jaisalmer district, in spite of very low rainfall (less that 150 mm) and extreme weather conditions, groundwater is available at a depth of about 50-60 m along the course of the defunct river and wells in the vicinity do not dry up throughout the year. The groundwater in the area is rich in stable isotope content as compared to other Himalayan rivers. Groundwater samples exhibit negligible tritium content indicating absence of modern recharge. Radiocarbon data suggest the groundwater is a few thousand years old. The levels of Carbon-14 isotope decrease along the river course downstream indicating hydraulic continuity of the Saraswati buried channel from Kuria Beri to Ghantiyalji. Evidence collected so far shows that the river disappeared due to a combination of reasons spread over a few hundred years possibly between 2000 and 1500 BC. The main reasons contributing to the drying of the river appear to be the loss of its important tributaries due to changes in river course, climate changes (like long periods of draught) and water seepage through earth faults, and fissures combined with the obstruction of river flow by shifting of sand due to high winds. The whole of northwest India, up to the Rann of Kutch, was subject to earthquake activity, resulting in raising of the ground, and creation of earth faults that contributed to the loss of water of this river. When the Aravallis range is traced north to the Himalayas, there is evidence of rise in the ground level on the line of Aravallis. This change in the ground level appears to have caused the turning of the river Yamuna eastwards to join the Ganges at Allahabad. This river capturing denied the waters of Yamuna to Saraswati. Another blow to the river Saraswati was struck when Sutlej took a sharp U-turn at Ropar moving to flow parallel to the river Beas, the Vedic Vipasa. Having lost both of its perennial tributaries, i.e., Yamuna and Sutlej, river Saraswati would have been a drying river in around 2000 BC. It is probable that desertification of Rajasthan would have taken place at that time. As supported by the hydro-geological evidence, the ground faults and sand movement would have caused the seepage of the remaining waters of river Saraswati to underground channels, leaving a dry riverbed. Last part of the legend is that the Saraswati meets the Ganges and Yamuna at the confluence (Sangam) at Allahabad (Prayag). Neither archæological finds nor satellite images support any evidence of the River Saraswati ever flowing east towards Allahabad, either over the ground or underground. Some modern scholars interpret the capture of Saraswati waters by Yamuna also to mean the confluence of Yamuna and Saraswati jointly with Ganges at Allahabad. If this is accepted, meeting of Sutlej with Beas has equal claim to the confluence of threeRiver, i.e., Sutlej, Beas, and Saraswati.